Spacious Wine Country Home in Spectacular Vacation Destination! A spacious Leelanau countryside home on private acreage that is close to beaches, wineries, casinos and The Sleeping Bear Dunes National Lakeshore; this hillside retreat offers a nice quiet setting and is close to the many attractions of Leelanau Peninsula. Our vacation home is privately owned and we personally manage the property. The home features an open layout with five bedrooms (two King, three with two twins each) three bathrooms, a fully equipped kitchen and plenty of room for up to 10 people to be comfortable. High speed wireless internet, a 50" LCD HD TV with satellite, DVD player and DVD library, board games, books or foosball can keep you busy indoors. Outside the home features two decks and a patio to enjoy outdoor living and a picnic table, chairs, Weber Grill and outdoor fire pit to compliment these spaces. The home sits on several private, countryside acres surrounded by orchards, fields and the Leelanau Conservancy Narrows property that provides a peaceful view and great sunsets right out the front picture windows. 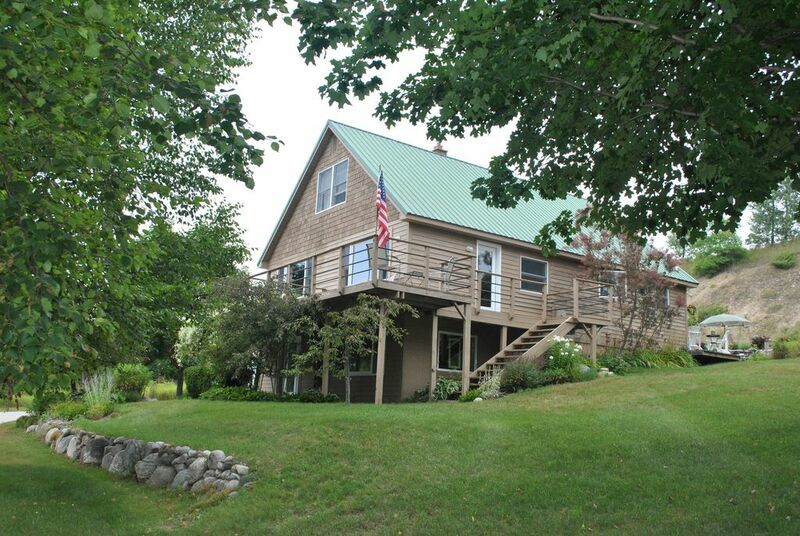 The location is very convenient to the many attractions of Leelanau County. Located just north of the Village of Lake Leelanau, providing close access to a public boat launch, beaches, wineries, dining, shopping and adventures. Suttons Bay, Leland and Northport are just a short drive and Traverse City is a 25 minute drive to the south. We have had many guests enjoy our home on the Leelanau Peninsula for family vacations, reunions, weddings, wine touring and more. Whatever your reason for visiting Leelanau, we look forward to providing a clean, comfortable and safe home for you to enjoy. Our Vacation Home is privately owned and we personally manage the property. Our vacation home was our family home for many years prior to moving to a historic farm just a few miles away. We look forward to hosting family, friends and visitors at our vacation home. We hope that if you have not visited Leelanau, you'll bring some friends and family and find out why Leelanau was voted the 'Most Beautiful Place in America' by the viewers of Good Morning America and was recently voted as one of the best places in North America to watch a sunset. If you have been here before, welcome back. A quiet, countryside family home on private acerage that provides easy access to the numerous attractions of Leelanau County. Full Gourmet Kitchen includes coffee maker, toaster, blender, crock pot. We very much enjoyed our stay in this friendly, comfortable house. It is convenient to everything one might want to do in the area, and the information book the Borres left is very helpful. The house is comfortable and the kitchen/common areas are great. The house is much closer to the road than I expected from the pictures, but fortunately there is very little traffic. We were also unsure of how much of the property we were allowed to walk on, as there are “no trespassing” signs posted in the orchard (which we had thought was part of the property). Clean, roomy, better than home feeling! Great house and location. Girls trip was awesome. Up north Michigan colors were beautiful. House was very accommodating and roomy. Owners were exceptional. Helped us work out a little glitch upon arrival and couldnt have been gracious! Thank you Bill and Jill for everything. We will be back for sure! Great property & location with many amenities. Fit our needs perfectly. Bill is great to work with! 9 family members and friends stayed here last weekend during my grandson’s wedding weekend. And Bill was gracious enough to let us check in earlier than usual due to the 2:3o wedding rehearsal. He happened to be there when we arrived about 15 minutes earlier than agreed to and gave us a tour of the house and we visited for awhile. Bill shared some of he and Jill’s favorite local places to visit during our stay. The house fit our needs perfectly with two bedrooms on the main floor, two on the upper level and one in the lower level. The living, dining, kitchen area are nice and homey and the kitchen was well stocked with appliances, dinnerware and cookware. We really enjoyed the patio and fire pit out back, as well! There’s a large deck with a grill and then you can step down to the bricked patio where table, chairs and the fire pit were nicely surrounded by plants, trees and a large hill. Very nice and private and on a clear night you can see stars for miles. This was especially appreciated by one of our group who lives in San Francisco! The mowed trails were also very nice for a mid-morning walk in the crisp fall air. We are already planning another long weekend trip for next summer. Our entire party of 9 highly recommend this property!!! Beautiful home, with all the amenities you could ask for! We had a great time at this Lake Leelanau rental. We stayed with 6 girls for our annual girls wine tasting weekend. We found there to be everything we needed, and then some. We enjoyed the back patio, it was so picturesque. House has no air conditioning, but they provide plenty of fans and we never had a problem (and it was 80-85 everyday). We would love to stay here again next year! Extremely clean and comfortable home, which easily accommodated eight adults. This home was wonderfully situated for all our excursions throughout Leland, Glen Arbor, the dunes, and the wineries in Sutton's Bay and Traverse City. It was clean and well-stocked, with a great kitchen for cooking and large tables for eating indoors and out. Bill was very helpful and responsive. We are a family of eight, with three adult kids and their spouses and significant others. There was enough room for everyone to spread out and be comfortable. Our adult kids love to play games and work on puzzles in the evening. There was abundant space for all of that, plus a sidebar for their drinks. There was plenty of counter space to prep and set up food, without having to sacrifice eating areas. The outdoor grill worked and the outside table was very nice. We never felt crowded in any area of the house. The master bedroom was very comfortable and served as the perfect refuge! When I booked, I did not notice that the home does not have air conditioning, which is not uncommon for the area. This was our only reason for discomfort, since we were there during a very hot week in August. There were plenty of fans everywhere and we used them! We had to keep a main window closed due to gaps in the screen letting bugs in the house. This problem can be easily remedied, and is unlikely to be an issue most weeks in a Michigan summer. As the week cooled down, we became more comfortable. We were minutes from a public boat launch to Lake Leelanau, which is beautiful. We were also an easy drive to the public beach in Leland, which was lovely. We also enjoyed stocking up from Nine Beans Row bakery, which is right down the road and makes fantastic cherry and apricot pastries and bread! Great property! Beautiful, well-equipped, great location! We stayed for a week - two families with 4 children under the age of 7. The accommodations could not have been better. Modern, clean, well-equipped, comfortable, good lay-out and beautiful! The location was ideal for us. We were close to Glen Arbor and Sutton's Bay and Leland. We would definitely love to return. our many thanks to our fabulous hosts! No additional cleaning fee. No security deposit.